Finally, even though the Kansas City Star opined that the September 1898 Blue Springs picnic "differed in nothing from the dozen other country picnics which have been held this year," Jeremy Neely's fascinating essay reveals that this gathering was anything but ordinary. Organized by Frank James (older brother of Jesse), it brought together former Civil War comrades who had ridden with William Clark Quantrill. These get-togethers, held until 1929, allowed aged bushwhackers "to share jokes and war stories" that, in the minds of many Lost Cause believers, justified their ruthless activities along the Kansas-Missouri border, including the notorious sack of Lawrence, KS on Aug. 23, 1863. For Neely, these reunions "illuminated the complex ways that memories of the border war served at once to unify and divide people along the Missouri-Kansas line well into the twentieth century." Neely finds that old stock Southern sympathizers defended "Quantrill and his men by emphasizing their courage and honor -- these were men who never harmed women, it was often said -- and by explaining their actions as justifiable responses to plundering Kansans and Unionists." 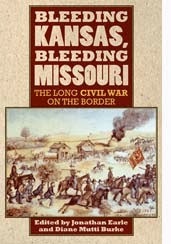 It is small wonder that the bitter embers of the Civil War on the Kansas-Missouri smoldered for years after official hostilities had ended.